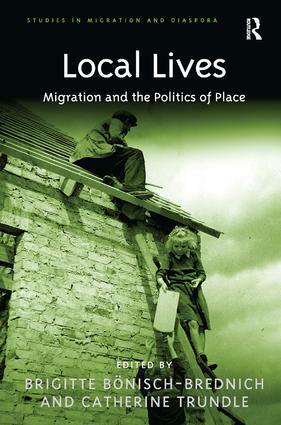 Contents: Introduction: local migrants and the politics of being in place, Brigitte BÃ¶nisch-Brednich and Catherine Trundle; Part I Migrants and the Politics of Land Ownership: Migrant routes and local roots: negotiating property in DhÃ«rmi/Drimades in Southern Albania, NataÅ¡a Gregoriè Bon; Against the gated community: contesting the 'ugly American dream' through rural New Zealand dreams, Catherine Trundle; Past imperfect: displacing Hawaiians as hosts in a 'drop out' community in Hawai'i, Lucy Pickering. Part II Landscapes of Belonging: 'We are not expats; we are not migrants; we are Sauliacoise': laying claim to belonging in rural France, Michaela Benson; Ambiguous foreigners: neighbours share more than geographical space, Jacqueline Waldren. Part III Houses and Homes: Intimate Migrant Place: A reluctant locality: the politics of place and progress in Santo Domingo, Erin B. Taylor; Little Anglo-India: making Australia 'local' at St Joseph's hostel, Robyn Andrews. Part IV Contesting Urban Place: Invoking a community of engagement; mobility and place in a small English town, Karen O'Reilly; Negotiating religious expression and citizenry belonging: Bosnian experiences in suburban Melbourne, Lejler Voloder; Migrants on campus: becoming a local foreign academic, Brigitte BÃ¶nisch-Brednich; Epilogue: the cosmopolitan justice of a direction home, Nigel Rapport; Index.